This page provides you with Lead Pastor resume samples that you can use for inspiration in writing your own resume, or for creating one through our easy-to-use resume builder. Below you'll find our how-to section that will guide you through each section of a Lead pastor resume. Pastors’ are an integral part of Christian society. A pastor is the one to comfort people in distress, to challenge them in complacency and, above all, to love them in each and every circumstance. If you are looking for the best Lead Pastor resume samples in the web, look no further as you have reached your destination! Our resume samples have been trusted by over 3 million people and we have created this guide to help you in your process of creating a resume for lead pastor position. 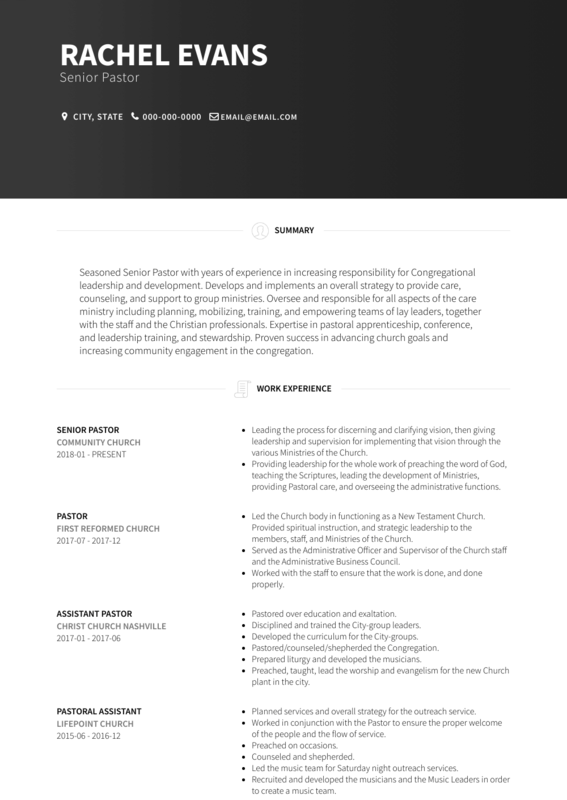 How to Write Lead Pastor Resume? If you want this role, you need to give 100% and get the best Lead Pastor resume ever. Let’s start from the format: there’s no doubt the gold medal here goes to the reverse-chronological layout: it presents your freshest wins up front. Friendly tones are far better than a simple fact-to-fact style as it can often be off-putting. What is more, you don’t want to add a funny undertone rather a serious but warm undertone instead. It is needed, indeed. The competition in your industry is so fierce that it is extremely impossible to decide who to hire, so that’s why a good summary section on top of your resume helps recruiters make a final decision. A perfect summary should be succinct and precise which means short and not vague. It is your pitch to your client: make it count! Use the words “best Lead Pastor” more than once. You don’t necessarily need to discuss every job you’ve had in the past ten years but rather highlight the ones you’ve had which relate to the offered job position. In this section, you will have to elaborate on your work history: did you engage a big staff of volunteers to serve the church and community through engaging teaching, leadership development, creative programming and empowering volunteers? You should include that. Have you been a highly committed community servant who enjoys building and maintaining meaningful, Christ-centered relationships? Are you compassionate and dedicated to helping others succeed through long term engagement? Include all of this. This is your chance to finally become the Lead Pastor you’ve always wanted to be. Tell them what qualifies you as the best fit for this role. If you need more tips on writing the best work experience section for a great Lead Pastor like you, check out our detailed resume guide. Education simply shows the person you are and where you’ve started, so please make sure you include it in your resume. Include any Religion courses you might have taken. New and Old Testament. And if you have been a member of Christian Studies Student Advisory Council, make sure you include that too. If an excellent Lead Pastor Resume sample is not enough, why don’t you check out one of the most efficient Lead Pastor resume templates we have been working on here : many professionals like you have successfully used it to take their career to the next level.